Hope you're doing great! Love you! Espero que esteja tudo bem convosco! Love you! Tou viciada nessa música! E as tuas calças são lindaaaaaaa!!! Nice outfit ! You are from Portugal ? All right then ! I've just followed you ! 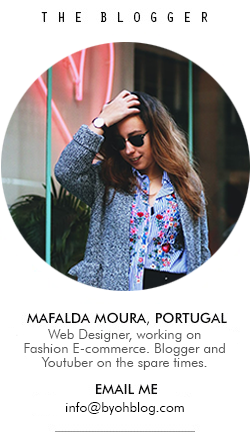 I asked you this because my BF and co-blogger is from Portugal ! If you want you can check our travel picture out there in our "Travel" category on our blog! Hi, I am new to your blog and I already love it (and those pants!! :D), decided to follow (as Aneta Mišíková):) maybe you could check my blog and decide if you want to follow? you can also join giveaway :) Have a nice day! great photos, with the background! love your pants! Fab pants. I love printed legwear! I also love printed pants! Looks great! Tambem adoro as calças ! Essas calças são mesmo lindas! I adore those trousers :) I love the pattern!! GIVEAWAY a decorrer no meu blog! Lovely blog :D and photos. would you like to follow each other? Just found your blog dear. Very nice outfit, love your pants! very nice jumper, simple but the texture is perfect!